As a company with over seven decades of experience, our team at Pyle Fence knows the importance of a practical and aesthetically pleasing fence and gate. That’s why we were voted Best in Baltimore 2015 by Baltimore Magazine! Whether you’re looking for a gate to secure, enclose, or decorate your property, let our experienced fencing contractors help you make the selection that’s right for you. A gate can be used for privacy, protection, or decoration on your residentialor commercial property. 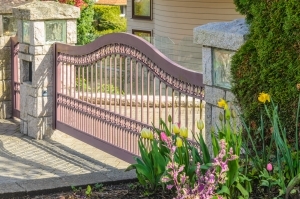 Whether it’s working with wood, vinyl, ornamental iron, chain link, or some other fencing material, we offer a wide variety of gate materials and styles to complete the look of your project. We customize our fence gates to fit your project’s needs and budget. With an A+ rating from the BBB, you can rest assured that we can complete your project in a timely manner. Call us at (410) 426-8319 today to request a free estimate!